A new variant of the RSPlug Trojan horse, aptly named by PC Tools as Trojan.OSX.RSPlug.N, was spotted in a warez web site masquerading as a keygen (serial number generator) for the Mac OS X Leopard. Unwary Mac users looking to save a few bucks on a pirated Mac OS X will most likely get infected by this Trojan horse, but if you're keen enough, you'll notice that this keygen, particularly the details in the web site as seen in the picture above, is pretty odd and dubious. 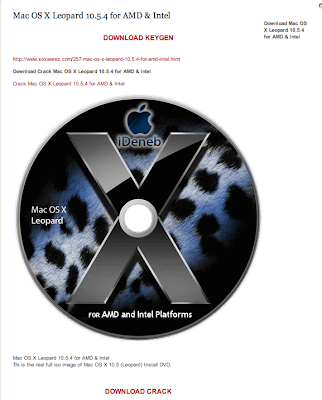 First, Mac OS X Leopard was never available for AMD processors as it only supports Intel, and PowerPC processors. Second, it doesn't make use of a serial number, so this keygen would be of no use for users who doesn't want to pay for legitimate software. Ehem, we shouldn't be supporting software piracy and downloading keygens in the first place. Anyway, this new version of RSPlug is essentially the same in terms of function like the other variants. Read a detailed description of the RSPlug trojan here. PC Tools iAntivirus has updated their database to protect its users from Trojan.OSX.RSPlug.N, so Smart Update now for utmost protection on the latest threats!